THE QUEEN OF FEEL-GOOD FICTION and the SUNDAY TIMES TOP FIVE BESTSELLER! The brand new novel from the Sunday Times bestselling author of The Queen of Wishful Thinking - a gorgeous read full of love, life and laughter. Marnie Salt has made so many mistakes in her life that she fears she will never get on the right track. But when she `meets' an old lady on a baking chatroom and begins confiding in her, little does she know how her life will change. Arranging to see each other for lunch, Marnie finds discovers that Lilian is every bit as mad and delightful as she'd hoped - and that she owns a whole village in the Yorkshire Dales, which has been passed down through generations. And when Marnie needs a refuge after a crisis, she ups sticks and heads for Wychwell - a temporary measure, so she thinks. But soon Marnie finds that Wychwell has claimed her as its own and she is duty bound not to leave. Even if what she has to do makes her as unpopular as a force 12 gale in a confetti factory! But everyone has imperfections, as Marnie comes to realise, and that is not such a bad thing - after all, your flaws are perfect for the heart that is meant to love you. 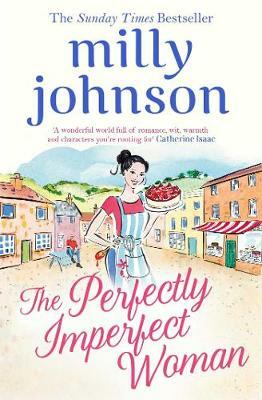 The Perfectly Imperfect Woman is the heart-warming and hilarious new novel from the queen of feel-good fiction - a novel of family, secrets, love and redemption ... and broken hearts mended and made all the stronger for it. Thoroughly enjoyed this, one of her best titles yet. A brilliant cast of characters in a very compelling and mysterious plot. Meet Marnie Salt. 31 years old, single, closet baker and a disappointment to her mother.